It's free, sign up, check it out, mess around, build a profile, invite a loan officer or co-agent, add your brokerage, make a property site set your lead capture, then add your DYS photos and your ready to go! Live Property Website Sample and all the Accessories you Get! Leverage your listings and getting your name and brand out-there! Also these property sites stay active even after the property is sold so you can impress prospective sellers. The DYS Marketing Dashboard is Free to use with each shoot, there are so many tools you can use and we encourage customers to get in the system and use it. HOWEVER, we do understand some customers are not "tech-savvy" or don't have the time. If this is the case we'll set up all your marketing for $35 or we've created Mega Marketing shoot packages which already include setup. This link is what you would share most and there are a ton of templates and colors to choose to match you brand. Put it in Facebook and other social media sites and the best way to get listing referrals is have your seller put it in their Facebook feed so you get friends and family calls. Gone are the days of open house sign in sheets and printed flyers. Now when a open house guess ask for a flyer or more property information easily enter their name and phone number in your phone and a link will be text messaged to the open house guest and their info is saved to follow up later. Yup, it's that easy here's the link where the magic happens. Here is the capture link you would have open on your phone during a open house. 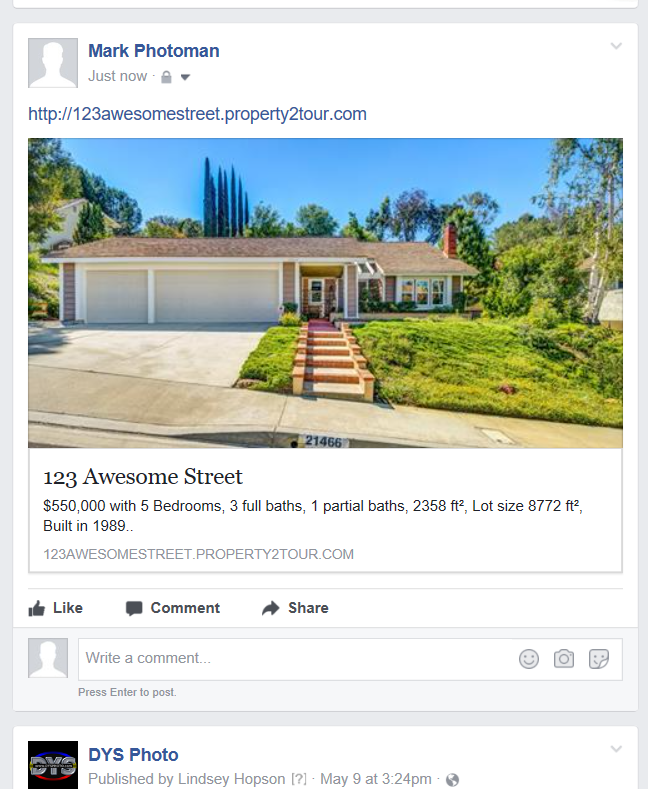 This is what the above link looks like in a your Facebook feed (just copy/paste the link above to your feed and click Post) good to have the Sellers also put into their Facebook feed so you can get friends and family referrals. You can print these out and send a PDF to anyone who wants a flyer on the property. There many templates you can use to match your brand colors and style. Your craigslist add looks professional and follows the newer Craiglist ad guidelines and Craiglist has a open house feature too. 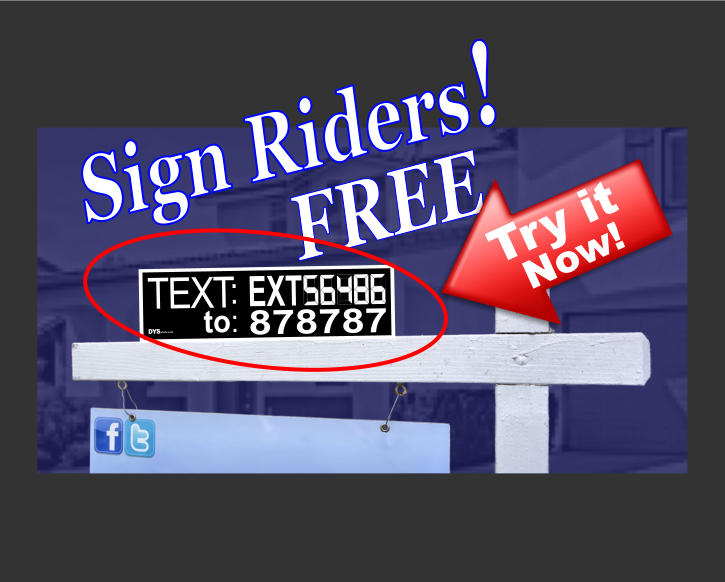 Text lead capture sign riders are FREE make sure to ask the photographer for one at your shoot or let us know when ordering your shoot you want one. This you can share but it's also on the website too so not as good to share as the above link but you can post the video on your agent or broker site too. These below are your call and text lead capture anytime someone calls or text it saves it as a lead in you dashboard and you are notified via text you have a inquiry. Some MLS systems allow you to enter a link for a virtual tour like above and put in a website link this is a unbranded MLS compliant website for the property. Know exactly how your efforts are going and be able to share website statistic reports with clients and colleagues on a regular basis automatically or send a one time report. This report shows unique visitor, total visits, and total page views with graphical breakdown. * Marketing Dashboard use is with DYS Photo images only.